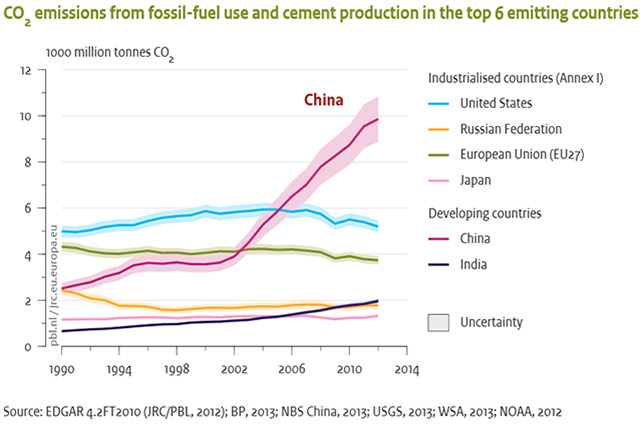 Once again a VERY good analysis of China’s impact on global pollution. They’re all good charts, but this one should sum up why you should read this and why any agreement with China HAS to hold them accountable. It’s worth a read. All the graphics are easy to understand and revealing. Not just of the volume they show, but revealing by their ABSENCE in the regular news media. The information is all our there. It’s readily available for those LOOKING for it. Only it doesn’t support the whole “Hate the Western World” theme they have going on. It also draws into doubt the whole claim of Chinese economic “success” on a large scale… or Russian… or any Socialist/Communist country. After all, if the major reason they are “succeeding” economically is because they are polluting the hell out of the planet… it kind of hurts the Watermelon movement. This is the best source I’ve been able to find for the term. Anyway, the “Left” has become quite adept at gymnastics trying to bend over backward to try to avoid hard truths. For example, the worst abusers of womens rights, gay rights and in general human rights is the Muslim world. Similarly, the worst polluters in the world are the Communist/Socialist countries. You can’t ignore that just because it’s inconvenient. It’s not a coincidence. The simple truth is that those are direct results of those types of cultures and governments. It is the very lack of Individual Freedom that causes both those maladies. Freedom that you find in Capitalism and Democracy. The two things that the “Left” continues to rally against. Our new agreement with China states we must reduce our gases by 20% or so. China has to do NOTHING until 2016! This is stupid because by then there economy will change and reductions will take place anyway. Reminds me of Japans takeover of our auto industry. The Japanese govt. subsidized car manufacturers that lost money on purpose to gain a percentage. We did nothing, even though our laws say it is illegal.